Click here if you need to contact customer service. Give the gift of Electronic Musician! 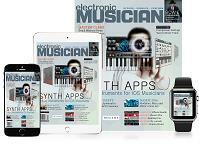 Keyboard Magazine is now joining forces with Electronic Musician to serve you better. As part of your Electronic Musician subscription will be a section completely dedicated to the Keyboard reader. You can sign up for an All Access option which includes print and digital versions, or the Digital Access edition. Either way, Electronic Musician with the newly added Keyboard section is a great read. Please fill out the contact information for the person who will be receiving your gift. Fill in your name and email address along with your credit card information. All questions marked with an asterisk are required. My billing address is different than my shipping address above. Sign up for Electronic Musician Magazine’s FREE eNewsletters to get timely industry information you need delivered via the convenience of email. Electronic Musician XTRA weekly editorial e-newsletter is comprised of exclusive content, breaking news, product info, lessons, artist notes, hot releases, and more.